Noonan on Silver: Wait for Price to Confirm Its Intent – Then Start Stacking! So says Michael Noonan (edgetraderplus.com) in edited excerpts from his original article* entitled Silver – The Power Of Thought Will Ultimately Prevail. Silver remains incredibly undervalued, and that bodes well for all of us silver stackers. The fact that silver and gold have purposefully been suppressed by the moneychangers means the…next price rise in silver will be greater than ever. Any time anything has been artificially manipulated, it makes the ultimate outcome far worse than was planned by those doing everything possible to prevent a rise in prices. Central planning always fails. Do not mess with Mother Nature! 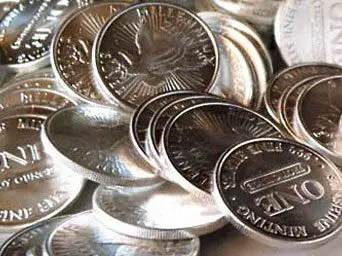 The above information has been presented many times, and in many ways, over the past year yet the price of silver languishes near recent lows. Why? Because people have an appetite for this kind of information. It serves as a crutch to bolster flagging belief that silver and gold will rally any time soon. From our perspective, we are looking at one of the best opportunities to be buying the Precious Metals in our lifetime. Okay, second best. [Nick Barisheff: “Today’s the 2nd-Greatest Opportunity to Buy Gold Since 2002!”] Those who have been buying since $4 and $5, and up, deserve recognition for knowing far better that silver stacking was, and continues to be, the right thing to do. Fundamentals are real. We are not being dismissive of their importance. Instead, we see the perception of their impact as being misplaced, for now. Ultimately, they will prevail, but the greater area of focus of a failed fiat financial system deserves center stage. It is the gross distortion of paper fiat being forced-fed down the throats of the public and sovereign governments, like a goose being prepared to produce foie gras, that virtually guarantees that the price of silver, and that of gold, will rise to appropriate levels that reflect the degree of manipulation over the past few years. It is hard to imagine that the elites may have miscalculated so badly, but that is a distinct possibility. Perceptions of the elites and their New World Order, as controlled by their central banking system and determined by the Rothschild Formula, “Give me control over a nation’s money, and I care not who makes the laws”, has always been to see them as impregnable. Could it be that their success over the past few hundred years, unopposed, has led them to become susceptible as a consequence of their own arrogance and their own perceived sense in invincibility? We do not know, but it was a thought that was unthinkable in the past recent years…. Who, growing up in America, would have ever thought that it would be China and Russia that could suppress the suppressors? The most coveted prize of the Rothschild formula was to own all the gold, following the dictates of the Golden Rule, and rule they have, but their days may be numbered. history, there has always been some degree of manipulation over all markets. It is human nature to go against Mother Nature. Silver may be the one to watch for 2014. It is likely to outperform gold because the gold-to-silver ratio is so high, currently just under 62:1. Reversion to the mean, which is nearer to 28:1, strongly supports this idea. This is a fact and not a perception, so there is a higher degree of validity to it. Gold:Silver Ratio Suggests Much Higher Future Price for Silver – MUCH Higher! Silver is at an area of indecision within a down trend that has lost momentum. Rather than guess at what may happen, and possibly be wrong in guessing, better to wait for price to confirm its intent, and then take some action in harmony with the developing momentum. As to the physical, keep on stacking! Let the market take its course, naturally, or with temporary interference, and do not be distracted by purposeful distractions. It is but a matter of time. History is on the side of silver, and the rewards will be well worth the patience. 9. Noonan: Is Gold’s Decline Being Caused By Fed Payback Time to China? 11. Russia & China Have Power to Collapse U.S. Economy! Is Hoarding of Gold Their First Step In Doing So? 13. Gold:Silver Ratio Suggests Much Higher Future Price for Silver – MUCH Higher! Here is what I think will happen with PMs in America – and we are almost there now and it well happen this year. 3. the price is actually dropping. So what does this all mean? The golden government rule applies here. – The government is causing the problem because it wants the COMEX to default. – When it does the government will come to the rescue an try to resolve the problem by freezing the PMs prices at these artificial low levels until they are ready to go public with their plans for the establishment of a NWO (New World Order). – after the markets collapse and their dirty work is done they will raise the price of the PMs say 10% to 15% of the average mining cost of the world and will move from that price as mining costs move. – But it doesn’t end there! All future production of PMs will have to be sold to the U.S. Government. Wait if you dare, but since ideally you are acquiring Silver (and/or other PM’s) for long term gain and/or as security against sudden loss in the value of paper money like the US$, today is just as good a time as any other since a sudden shift in prices which could happen at any time for any reason, make waiting a BIG mistake. Using your vehicle tires as an analogy, imagine the risk you are taking by deciding to not replace them sooner rather than later, since your life and the lives of all those that ride in your vehicle depend upon the condition of those tires. Sure you might put off replacing them for a couple of days or even a few months but if you have an accident because of those tires, you will be forever haunted by that poor decision. Using an extreme case, imagine that forever reason once your tires fail you are unable to get replacements for a long time, suddenly the cost savings of waiting to replace your tires when you had the opportunity is nothing compared to nw having a vehicle that cannot be used. By waiting to purchase PM’s at hopefully a much lower price (at the bottom) you are taking a large financial risk because any day, for whatever reason PM may suddenly skyrocket upward and you will be unable to acquire any except at a even more inflated price, if at all, should supplies of PM’s suddenly be reduced to zero by large investors who gobble everything available up.